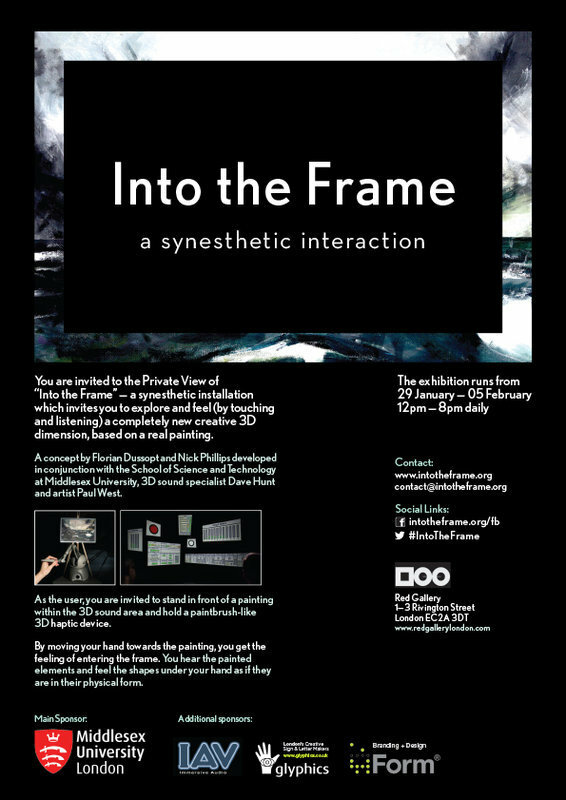 ‘Into the Frame’ is a synesthetic installation which invites anybody to explore and feel (by touching and listening) a completely new creative 3D dimension based on a real painting. As the user, you are invited to stand in front of a painting (within the 3D sound area) and to hold a paintbrush-like 3D haptic device. By moving your hand towards the painting, you get the feeling of entering the frame. You feel the shapes and textures of the painted elements under your hand as if they are in their physical form. You can explore and interact with the immersive 3D sound-scape and different sound textures to feel the space and depth the painting represents. Using the senses of 3D sound and touch (force feedback) – via a haptic device) the users make use of all their senses and imagination to explore the world suggested by the painting. A concept by Florian Dussopt and Nick Phillips developed in conjunction with the School of Science and Technology of Middlesex University, 3D sound specialist Dave Hunt and artist Paul West.